An interdisciplinary team, led by researchers at Cornell University and the U.S. Department of Agriculture-Agricultural Research Service (USDA-ARS), today published the most comprehensive analysis to date of the corn genome. Funded in the United States by the National Science Foundation (NSF) and the USDA, the work was a collaborative effort by scientists at 17 U.S. and foreign institutions that include the University of Wisconsin-Madison; University of Missouri-Columbia; North Carolina State University; Beijing Genome Institute; University of California, Davis and the International Maize and Wheat Improvement Center, Mexico City, Mexico. 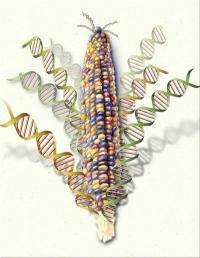 The study appears in two corn genome projects published in separate reports in the June 3 issue of the journal Nature Genetics. The analysis could also help those, who develop corn yields as a source of fuel, who manage crops in the face of changing climates and who are concerned about the diminishing supply of arable land and growing populations, he said. Last year, the economic value of the U.S. corn crop was $76 billion with U.S. growers producing an estimated 12 billion bushels, more than a third of the world's supply. Corn is the largest production crop worldwide, providing food for billions of people and livestock and critical feedstock for production of biofuels.